With a choice of depths including deep, shallow or bedstead, our bases are available as either a platform top or sprung edge, which with its robust 13g open coil unit and side reinforcement offers the ultimate support for a pocket sprung mattress. The deep bed bases have boarded sides for additional strength and all are mounted on hard-wearing all metal orbit castors. On our shallow bed base the legs are solid wood, attached with sturdy fittings that have been designed to provide superior long lasting strength and stability for the demanding hotel environment. Our bed bases come with headboard bolts fitted as standard. All of our bed bases can be upholstered to co-ordinate with you room décor. This negates the need for a valance and gives a smarter, more contemporary finish. Upholstering is often more cost-effective than valances too. The bases come in one or two pieces, dependent upon the size. Bed bases of 120cm width and above will be manufactured as a ‘Zip and Link’ bed sets, in 2 pieces, for ease of access and will have brass link bars as standard. Other colours of link bar are available. The illustrations on the right show the standard dimensions for the Pinnacle collection. 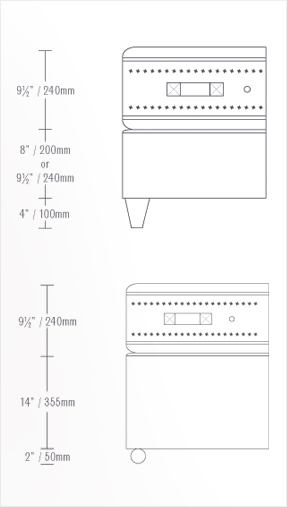 Bespoke bed base heights and leg options are available.